Got Buzz @ Kurman Communications: April 16 is National Eggs Benedict Day - Celebrate at Elate. 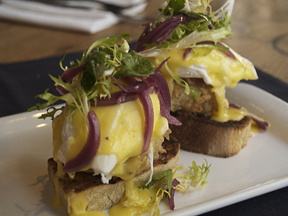 April 16 is National Eggs Benedict Day - Celebrate at Elate. Eggs Benedict is one of those delectable treats that should be enjoyed in all its sinful glory. Don’t forget National Eggs Benedict Day is Monday, April 16. Elate's new Weekday Brunch menu will be spruced up on this day with Chef Michael Noll’s unique Country Fried Pork Belly Benedict ($13). Need we say more. Don't forget that Elate's bottomless Mimosa is always available at brunch for $20 with the purchase of an entree...a great way to celebrate. Elate, 111 W. Huron at Clark, 312.202.9900.